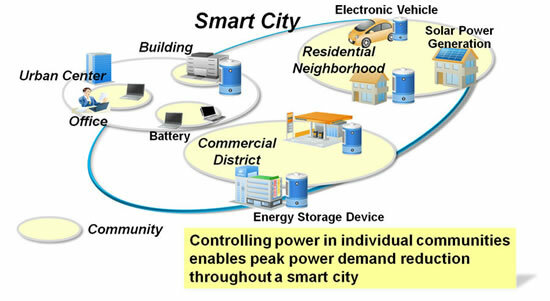 Fujitsu today announced industry’s first development of peak power demand reduction technology intended for deployment in smart cities. In the past, peak power demand reduction has been handled by installing energy storage devices in buildings or households and using them during times of peak power consumption, then recharging them during off-peak periods. This approach, however, carries the risk of overlap between storage device recharging periods, thereby actually exacerbating the peak power demand. With the new technology, a wide range of data—including the power consumed by each office and residence, as well as the usage patterns and charge levels of decentralized energy storage devices installed at such locations—is collected in the cloud. By enabling cloud-based integrated control of energy storage devices, peak power demand can be effectively reduced. 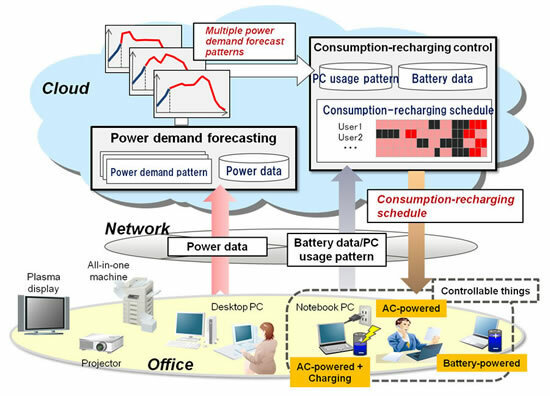 Because the system can plan a recharging schedule that takes into consideration multiple versions of demand forecasts and user usage, it can handle a wide range of power demand fluctuation without loss of usability.During a test study in which the technology was put into use to control the electricity consumption and recharging of batteries installed in a large number of notebook PCs dispersed around an office, the technology succeeded in reducing the peak power demand of the entire office by approximately 10%. Fujitsu aims to deploy the technology in smart cities to help bring about the creation of societies that are better able to supply their own energy needs.